Chapter 5: Who Are the Allies of Humanity? 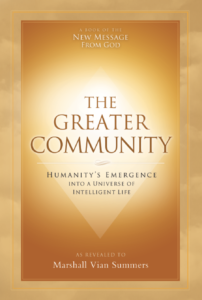 The Greater Community is a book of Revelation given by the Creator of all life to the human family through the Messenger Marshall Vian Summers. In this book of Revelation, God is throwing open the doors to the universe of intelligent life in which our world has always existed. Here God is revealing to humanity the “Greater Community” of worlds in which we live and with this our destiny to emerge out of our isolation in the universe as a free and self-determined race. Only God could provide a Revelation such as this. Only God could give humanity a true and clear picture of life in the universe, for God is the Author of all life in the universe. This book contains revelations about life in the universe never presented to humanity before. Here God is preparing us for the realities, the challenges and the opportunities of engaging with life on a larger scale. With this is presented the awareness and education we will need to protect our freedom and sovereignty, and to contribute the spiritual gifts of our world in a larger community of life in the universe. Only a Revelation from the Creator of all life could bring this to you. Throughout human history, the Creator has given successive Revelations to meet the growing needs of people and nations at great turning points in the evolution of humanity. Through the Prophets, Messengers and revealed Teachings of the past, God’s Revelations have entered the world at specific times to advance human awareness and awaken humanity to the needs and opportunities of that time and the times to come. However, none of God’s previous Revelations could prepare us for the reality of the Greater Community and reveal the meaning and destiny of human spirituality within this larger context of life. Humanity simply had not progressed that far in ancient times. The tribes and nations of the world had not yet developed into an international community capable of world awareness and communication. The world had been visited on a small scale in ancient times, but nothing like the scale of contact underway today. Humanity had not yet arrived at the threshold of emerging into a Greater Community of life in the universe. Now that threshold has come, and the process of Revelation is continuing anew through a New Message from God, of which The Greater Community is but a small part. The words of this text are a direct communication from God, translated into human language by the Angelic Presence that watches over this world, and then spoken through the Messenger Marshall Vian Summers, who has given over 30 years of his life to this process of Revelation. Though it appears to be a book in the hand, The Greater Community is something far greater. This is a book of original Revelation from God given to prepare each person for the next chapter in the development and evolution of the human family. This Revelation holds a key to the future and well-being of every person on Earth. The Greater Community is the fourth book of Volume 1 of the New Message from God. The Greater Community contains 11 individual revelations, each given at different times and places and compiled by the Messenger into this text. The Greater Community presents an expansive vision of the universe in which we live. Here God reveals what awaits humanity in the universe at large, the challenge and complexity of interaction between worlds, and the essential tools humanity will need to navigate its engagement with forces from beyond our world. Here the human family eclipses its millennia-old isolation in the universe and learns to interact wisely with other forms of intelligent life. This interaction will greatly expand how we view ourselves, God and our place in the universe. Our world is emerging into a Greater Community of intelligent life. Contact has begun, and our isolation in the universe is now coming to an end. Yet this is not contact of a beneficial and benign nature. This is an Intervention into human affairs that threatens to undermine our freedom and survival as a race. This is the greatest event in human history. It is happening now, yet we are unaware and unprepared. Contact has begun at a time when we are racing towards a dangerous and uncertain future in our world. Humanity is outstripping the Earth of its life-giving resources at an alarming rate, changing the climate of the world, and degrading and destroying the natural environment as never before. At the same time, political, social and religious conflict and division are escalating, fracturing the human family when instead we must be working to find a stable and functioning unity to ensure our collective survival. We are fractured and divided and this makes us vulnerable to outside influence and intervention from the universe around us. The Greater Community emphasizes that humanity has reached a critical threshold in its evolution, a time of convergence when the reality of a changing world and the reality of Intervention from the universe collide. The revelations contained in this book teach how these two realities are connected, what this time of convergence and collision will mean for us and how we can prepare to navigate this new and challenging future. We now stand at a juncture where we must make a fundamental choice: Do we work together for the safety and survival of the human race and perhaps the future of all life on Earth and, with this, prepare for the reality of contact? Or do we plunge deeper into the chaos of competition, division and war, making our world ever more vulnerable to Intervention from beyond and obscuring and denying the clear truth that we are one humanity with one destiny in the universe? This is a choice not only for leaders and governments, but for every person on Earth. This choice will determine not only our survival in the world, but within the Greater Community of worlds as well. The Greater Community reveals that alien forces from beyond the world have been operating in our midst for many years. These forces do not represent a friendly visitation but instead a dangerous Intervention with an agenda to gain access to the Earth and its resources. This Intervention seeks to take advantage of the vulnerabilities of the human family, undermining our fragile trust in one another, demeaning our faith in human leadership, and exacerbating the divisions and long-standing conflicts between nations and religions. At a time of great internal change in the world, this Intervention poses the greatest threat to humanity’s freedom and sovereignty we have ever faced. The arrival of dangerous forces from beyond our world signals that our destined emergence into a Greater Community of worlds has begun. Our isolation in the universe is over. Like the natives of the New World centuries ago, discovered by colonial powers eager for wealth, resources and advantage, we have been discovered. Now we are all the natives of the “new world” and must deal with intervening forces from beyond our world. We are unprepared. And yet now the preparation has been given, given through the power of Revelation from the Creator of all life. Though challenging, this presents the greatest opportunity for humanity to outgrow its destructive and primitive tendencies and finally establish a level of cooperation, stability and security never before achieved. The revelations contained in The Greater Community teach that it is the convergence of the Great Waves of environmental, social and political change in our world along with humanity’s emergence into the Greater Community that create the most powerful opportunity to unite the human family—the most powerful opportunity we will ever have to finally bring an end to war and the destruction of our natural environment. This will be achieved not through high idealism, but out of sheer necessity, for this is a requirement for freedom and survival in the Greater Community. In facing a non-human universe and the Intervention that is operating in our world, we can see that our differences as humans are small. Here we can go beyond the political, religious and ethnic lines that have divided us in the past in order to protect our future and freedom as a human family, which are now being threatened from beyond. Finally, the disparate groups and factions of the human family can come to the table, recognizing the necessity of stewarding the Earth, its environment and its resources, and securing this Earth as our one home in a Greater Community of worlds. All of this becomes a natural desire and a natural direction when we adopt a Greater Community awareness, an awareness that accounts for life beyond our world. The power of this greater awareness to resolve the problems of our world today should not be underestimated. The Greater Community presents the reality of Knowledge, the spiritual intelligence that lives within each person. This Knowledge is native to us and, once developed and brought forth, will naturally move through us to address the growing problems of our world. It is Knowledge that will enable us to correctly discern the alien Intervention in our world along with its intentions and its activities. Here Knowledge is the source of our innate ability to see and know the truth beyond any force of deception or manipulation. This is a critical strength that humanity must develop if it is to safely and wisely engage with powerful forces from beyond the world. In addition to the revelation on Knowledge, The Greater Community presents Wisdom from the Greater Community itself. Here God is connecting humanity to those races who have passed through the evolutionary challenges we are going through now to cultivate and express a greater spiritual awareness and ability in their worlds. These races have the potential to become the Allies of Humanity and have been called by God to provide an education and perspective to prepare our young and emerging race. For the first time in history, a New Revelation from God is being accompanied by a gift of wisdom and relationship from those in the universe who are allied with God’s work in the Greater Community and support humanity’s emergence as a free and self-determined race. By coming to understand the wisdom of the Allies of Humanity (learn more at www.alliesofhumanity.org), we come to see our innate inclusion within a larger community of life and the greater process of development and spiritual evolution our world is called to undertake. While The Greater Community speaks on the Allies of Humanity, it also warns us of an Intervention in our world: the arrival of dangerous and predatory races from the Greater Community, commercial forces who seek to gain access to our world, its resources and its people. Here God is sounding a warning to humanity. This encounter has the power to undermine human civilization and destroy human freedom. Yet this threat also presents the necessity for human unity and the end of human conflict. This is the power of the coming of the Greater Community. It is for this reason that God has spoken again to provide a Revelation of warning, blessing and preparation for our world. Contact with intelligent life in the universe is a world event like no other. It is the next great step in the development and evolution of the human family. It is unstoppable. It is inevitable. It is happening now. Here we must choose to either undertake the preparation and education for the Greater Community and, in so doing, ensure the freedom and sovereignty of our world, or continue to fight and struggle with each other, blind to our common future and blind to the Intervention now present in the world. It comes down to the decision of each person: the decision to be aware or to be unaware, the decision to prepare or to be blind to a future now racing towards us. Remarkably, you are in the world at this time. You are coming to learn about humanity’s emergence into the Greater Community, and you have found this book, a book of Revelation from the Creator of all life. It is no coincidence that this is the case. We each have been sent into the world at this time to serve the needs of our time and of a world in transition. Indeed, some in the world today have a Greater Community connection and lineage that extends beyond this life alone. The revelations of The Greater Community have been given to activate this awareness in you, to call forth the deeper Knowledge that you carry, and to provide you with the education and preparation you will need to be a contributor to an emerging world. In time, this will bring true clarity, inner certainty and direction to your life, for now you are moving with the greater movement of the world itself. Now you can gain a greater understanding of the true context for your life and the mysterious and perhaps inexplicable calling that has brought you to this point. This understanding will naturally call forth the gifts you carry, the gifts you brought with you from your Ancient Home to serve the world at this time. The door to the Greater Community is opening now. Never before has this door opened to the human family. Now it is time to pass through this threshold and prepare for a greater life in a greater universe of worlds.